Yep that works for me too! Very nice. I see them come up for sale every so often around here but the prices are always redonkulously out of reach for me. yep it works, but heh, .338LapuaMagnum the fire power you own, I thought you were in somewhere like Denmark or Germany? do they let you have nice semi autos etc like that there? I can't remember where you noted you were in another thread too many members here for my poor memory....but seems like it was the German Danish area. Germany, jawohl. Except for the AUG you can have most semi-autos as a competitive shooter. The AUG as seen above can only be bought/owned by hunters, though. I am a bit of a lucky guy with a private manufacturing licence for firearms and suppressors. I also work in the firearms industy and use my collection for studies. Since suppressors are now allowed for most hunters, the knowledge in the heads of the common user is based on myths and movies. That's why I try to educate as many as possible that suppressors are not the holy grail they thought they would be. And there are other issues, especially with semi-autos and wear on all moving parts. Lots of work but a fun way to spent my time off-work. One of the young guys in my Platoon had one among various other rifles. No wife, girlfriend or kids probably explained it. I like them and never had a problem with carrying one for the last 20+ years, I'd be keen to add one to the gun locker....after I win lotto.....and pay off the mortgage. 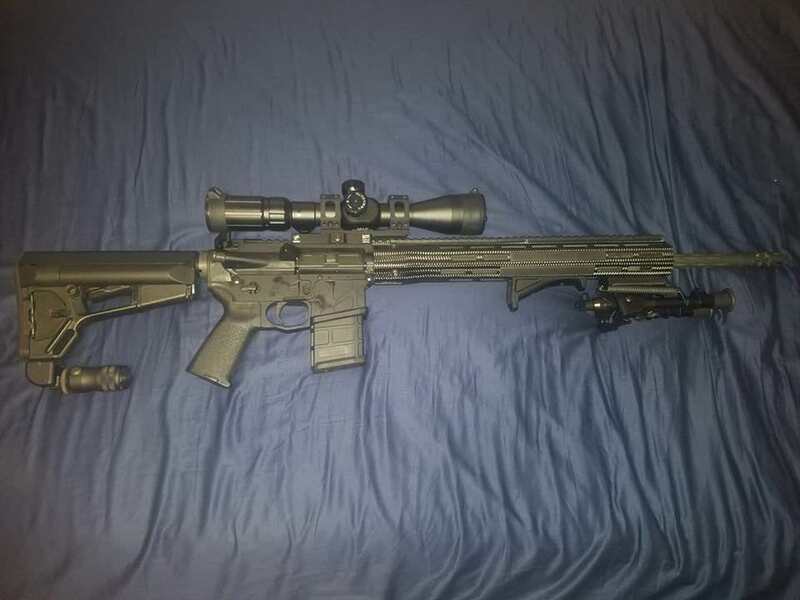 Finally got an AR-15, Florida talking about a 2 year "pause" on sales of them made me jump on it. Parted this one together off of someone else's kit build that was mediocre save for its barrel. Sold off the parts I didn't want to a friend who's building their own AR. Very nice. I like the mono-pod on the stock. What glass and mount have you got on top of it? Do you find the forgrip to be a little close to the bipod mount? What glass and mount have you got on top of it? American Defense Recon 30mm QD mount, supposedly return to zero but I have not tested that yet. The optic is a Primary Arms 4-14x44 ACSS HUD DMR 5.56, which I chose due to a soft spot for scopes that have simple rangfinding systems and holdovers built into the reticle. Do you find the forgrip to be a little close to the bipod mount? It is a little, I may move it back some, but for now I grip it either all fingers on the AFG, or occasionally run my index finger in front of it, there is just enough space to comfortably fit my finger. Absolutely. No batteries to fail, great optics, great service.... but pricey. 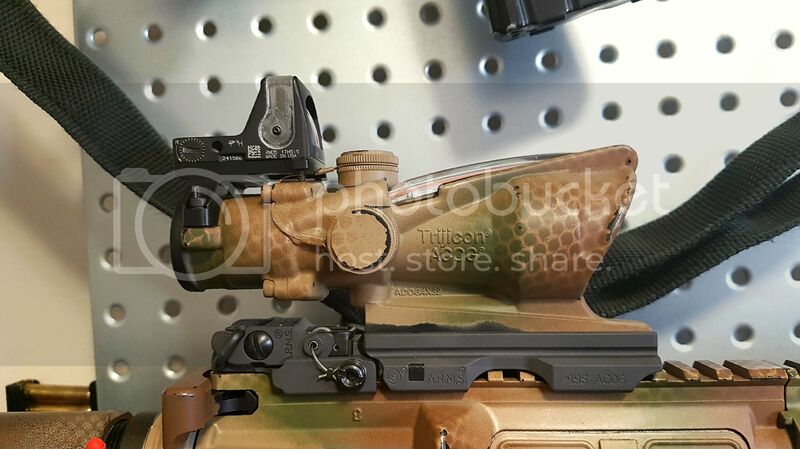 Is that an RMR on top of the ACOG? Last edited by digrar; 26-04-2018, 04:58 PM. Reason: No need to quote the post, it's just there ^ mobile users in particular don't need to be scrolling through countless double ups of pics. Yup, I've had the ACOG for a bit, managed to source a mount in Quebec for the RMR, and just picked up the dual-illuminated RMR in the mail today. And like you said, no batteries to fail, love it!
. Assuming that is a back up iron sight behind the ACOG how is that meant to pop up? Assuming that is a back up iron sight behind the ACOG how is that meant to pop up? It's an ARMS #40L, the bar at the rear is a hook that holds it back. Flick that away and it springs up. Doesn't go up with the ACOG mounted obviously. Went to range on Saturday to have a proper play with the Ruger and the new scope (and this time I remembered to bring the bolt!!!). It was raining so hard that about half the time you couldn't see the targets at 100m and the spotting scope kept fogging up. Fun though. LOL! that sounds like mate and i used to go fishing in his boat when it was below freezing, our line and reels would freeze, and we had to wear insulated coveralls all day. Young and bulletproof. Best thing about lever guns, at least you can't forget the bolt. On the plus side, you are not the first one to ever forget the bolt, or to take the wrong bolt.